This hairstyle is another quick one that can be done in under three minutes. 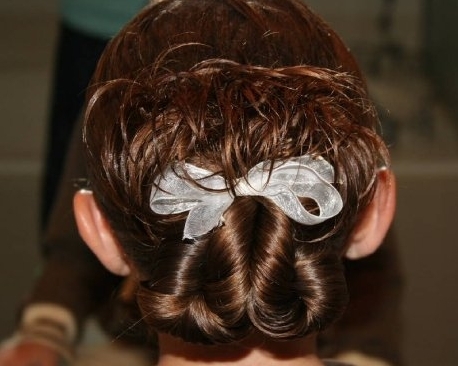 It incorporates the use of a ponytail separated into two twists that form the shape of a pretzel, and then tied off with a hairband and finished into a fun messy bun. You will find that this twist hairstyle is perfect for pretty much any occasion, formal or not, and can be ideal for a prom or homecoming hairstyle along with some really cute accessories. You will find that the pretzel shape will look more uniform if the twisted strands are about an inch or two shorter than the length of hair in the video. This style works on curly hair as well, and on girls of all ages. Enjoy! *Note from Mindy: If you notice the extra large camera in the background, that is because ABC News in NY sent a camera crew to our home for an upcoming 20/20 primetime special on YouTube that will be airing either at the end of June or in July. In all, they were at our house nearly 8 hours so it sure made for a busy day! We are not sure of the air date, but once we do… we will let you know!